But, we still have a few weeks left and with the holidays upon our doorstep, I am excited to deliver my last Q & A for the year, gift wrapped with a big bow–the wonderful Lee Winter. Lee is a Lammy finalist and Golden Crown award winner who penned the breathtaking thriller Requiem For Immortals and given us a lesbian superhero in Shattered. Her latest release is an ice queen romance titled The Brutal Truth. I am delighted to have her here today. Thank you, Lee, for taking the time out of your busy schedule to answer a few questions for inquiring minds, such as myself. Lee, you’ve mentioned you’re a gamer. Do you have a favorite game or a favorite type? Usually strategy and world building. Civ series. Or Fallout series. I like the latter in spite of the bloodied fighting aspects, not because of it. The building of settlements and so on appeals to me. You’re also a self-proclaimed gadget junkie. What gadget can you not live without? Right now I’m stuck to my iPad. It lets me read chapters of stories I’m editing, play games, take photos, it’s great for preventing me getting lost, since I have zero sense of direction. I am a sci-fi genre fan, as are you. What show/movie is your favorite? It changes a lot, but I really loved the intelligence of the Battlestar Galactica reboot…and had a mad crush on President Laura Roslin. As did everyone I gather. 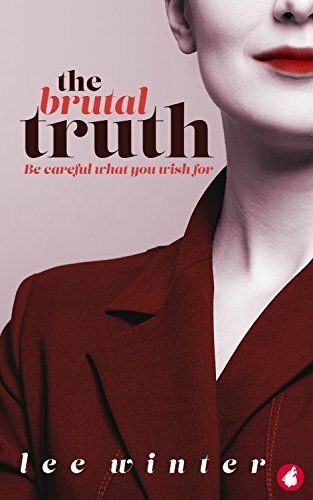 I had read that your latest novel, The Brutal Truth, which was excellent by the way, was derived from a fanfic you had written. Do you still dabble in writing or reading fanfic? I don’t write it anymore. I tried a couple of times, but I seem to have lost the feel for it. How depressing. I still read fanfic…anything from Devil Wears Prada or Supercat (Supergirl) by one of my favorite writers. What advice would you offer to new fiction writers? Just keep reading. It improves your vocabulary and gives you fresh ideas. Just keep writing. It improves your ability. Just keep living. Hunkering down in a bunker is not great for anyone (or their partner) and again you’re not exposed to fresh ideas. That last one I need to work on myself! If you were a character in a book, what kind of character would you be? Someone witty with a great one liner at the tip of my tongue. Not as acidic as Catherine Ayers (Red Files) but I like the idea I’d be funny often. If you could have any actress play Requiem’s Natalya in a movie, who would it be? Pamela Rabe. I saw a photo of the actress who plays Wentworth’s villain and just the way she was standing, looking, slightly mocking expression, oozing in confidence, it hit me like a truck. She could be a killer! (Sorry Pam.) That inspired the book. Her physical traits are in it as a result – 6ft height, long black hair, brown eyes, broad shoulders. Teleportation. I’d blink in to all these cool overseas conferences and visit my publisher in Germany and author mates and readers all over the world. Do you have plans to write another superhero story? Never say never, but not at present. A sequel to The Red Files, Under Your Skin. It’ll be out mid next year. Catherine and Lauren plan to get married. In Iowa. But nothing really goes quite how they expect it. Thank you all for being a part of the good things that happened this year. As a reward, visit BookBub December 13-17 for a free copy of my best seller Love By Design and be on the lookout for more deals to be announced on my Twitter after Christmas. There’s also two more days to enter to win any two digital copies of my books. Perhaps one to keep and one to gift? Or two to gift? Maybe two to keep? The choice is yours, but you have to Enter Now, before it’s too late! Oh and here’s one more chance to win a bundle of books with Les Reveur’s Christmas Competition. I wish you all a very happy holiday and a happy, healthy 2018!